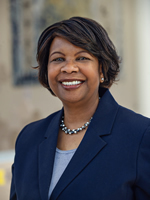 Deloris (Dee) Hunt, M.S., joined Michigan Medicine as Chief Human Resources Officer 2018. Dee has over 20 years of HR executive experience in the health care industry, most recently from Detroit Medical Center. During her 12 years as DMC’s CHRO, Dee led the system through major changes, including ownership and personnel transition from Vanguard Health Systems to Tenet Healthcare. She was also critical in the implementation of a best-in-class leadership development program, organization-wide talent growth and development, restructuring to enhance services while reducing costs. Prior to DMC, Dee was a System Director at Saint Joseph Mercy Health System for six years. In this role, she integrated the HR departments of the three hospitals into a cohesive department and redesigned and trained staff to meet the business needs of the organization. Also under Dee’s leadership an integrated applicant tracking, payroll and Kronos system was successfully implemented. Before joining St. Joseph, Dee spent 20 years at Henry Ford Health System in roles with progressive and increasing responsibilities. Dee earned her business administration degree from Wayne State University and Master Degree in General Administration from Central Michigan University.